WHAT: The University of Missouri invites the public to an interdisciplinary symposium and festival titled “Music and New Media at the Crossroads” to explore the profound ways in which new media and technologies are changing the way we create, disseminate, receive and comment about music. “We are truly fortunate to have this opportunity to bring together several of the leading practitioners and thinkers who deal regularly with new music, new media and the future of the field,” said Robert Shay, director of the MU School of Music. WHO: Influential composer Tod Machover, head of the Massachusetts Institute of Technology Media Lab’s Opera of the Future group, will deliver the keynote presentation. Other performers include virtuoso cellist Matt Haimovitz, a tireless touring and recording artist and musical pioneer; long-time music journalists Tim Page, a Pulitzer Prize winner and faculty member at the University of Southern California, and Greg Sandow, a blogger and freelance critic for The Wall Street Journal and faculty member at The Juilliard School; and eighth blackbird, the multiple Grammy Award-winning sextet. Machover will deliver the keynote presentation about his unique, multimedia operatic compositions. Haimovitz will present a solo recital to include works by Tod Machover. A panel discussion, “New Media and the Future of Classical Music,” will feature Page, Sandow, Machover, Haimovitz and members of eighth blackbird. eighth blackbird will present acoustic and electronic works. NOTE: This event is hosted by Mizzou Advantage and presented by the School of Music and School of Journalism, in partnership with the University Concert Series. During the last five years journalism students have been enrolling in music courses in the Carnegie Arts-in-Depth Program at the School of Journalism, and this festival celebrates the creative exchanges between media and music. Andrea Heiss, an assistant professor in the School of Journalism, is co-directing the symposium with Shay. Mizzou Advantage was created to increase MU’s visibility, impact and stature in higher education, locally, statewide, nationally and around the world. Mizzou Advantage is a program that focuses on four areas of strength: food for the future, media of the future, one health/one medicine and sustainable energy. The goals of Mizzou Advantage are to strengthen existing faculty networks, create new networks and propel Mizzou’s research, instruction and other activities to the next level. 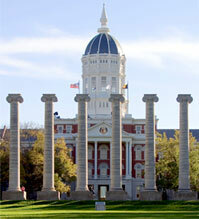 For more information, please visit http://mizzouadvantage.missouri.edu/news/music-and-new-media-at-the-crossroads/.